«Lord, in You have I hoped». «Into Your hands Lord, do I commend my spirit.» and left on the earth the memory of a man of firm faith and infinite love." Lovers of feasts, let us assemble and with songs of praise hymn the ornament of Hierarchs, the glory of the Fathers, the fount of wonders and greatest helper of believers, as we say, Hail guard, august leader and immovable pillar of the people of Myra. Hail brightly shining beacon, who irradiate with your wonders all the ends of the earth. Hail divine joy of the afflicted, and most fervent defender of the wronged. And now, all-blessed Nicolas, do not cease to intercede with Christ God on behalf of those who ever honour with faith and love your joyous and all-festive memory. "In the eleventh century the Byzantine Empire was going through some terrible times. The Turks put an end to its influence in Asia Minor, they destroyed cities and villages, they murdered the inhabitants, and they accompanied their cruel outrage with the desecration of churches, holy relics, icons and books. 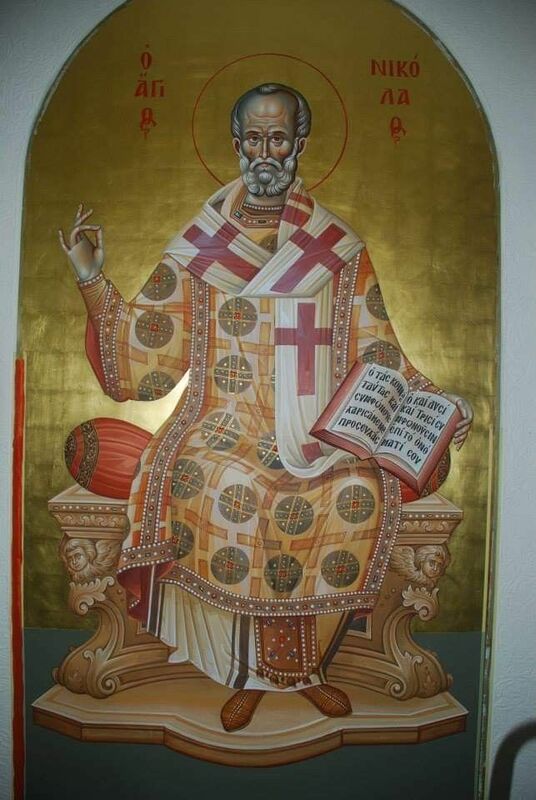 The Mussulmen also attempted to destroy the relics of St Nicholas, deeply venerated by the whole Christian world. In the year 792 the caliph Aaron Al'-Rashid sent Khumeid at the head of a fleet to pillage the island of Rhodes. Having lain waste this island, Khumeid set off to Myra in Lycia with the intent to rob the tomb of St Nicholas. But instead he robbed another tomb standing alongside the crypt of the saint. Just as they succeeded in committing this sacrilege, a terrible storm lifted upon the sea and almost all the ships were shattered into pieces. The desecration of holy things shocked not only Eastern, but also Western Christians. 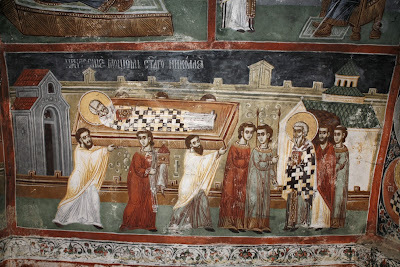 Christians in Italy were particularly apprehensive for the relics of St Nicholas, and among them were many Greeks. The inhabitants of the city of Bari, located on the shores of the Adriatic Sea, decided to save the relics of St Nicholas. In the year 1087 merchants from Bari and Venice went to Antioch to trade. Both these and others also proposed to take up the relics of St Nicholas and transport them to Italy on the return trip. In this plan the men of Bari commissioned the Venetians to land them at Myra. At first two men were sent in, who in returning reported that in the city all was quiet. In the church where the glorified relics rested, they encountered only four monks. Immediately forty-seven men, having armed themselves, set out for the church of St Nicholas. The guards, suspecting nothing, showed them the raised platform, beneath which the tomb of the saint was concealed, and where they anointed foreigners with myrrh from the relics of the saint. At this time the monks told them about an appearance of St Nicholas that evening to a certain Elder. 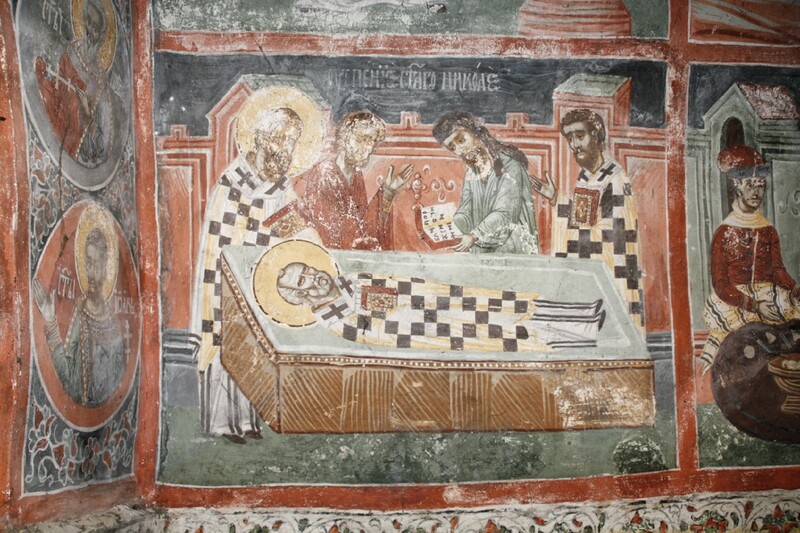 In this vision St Nicholas ordered the careful preservation of his relics. This account encouraged the barons, they saw an avowal for them in this vision and, as it were, a decree from the saint. In order to facilitate their activity, they revealed their intent to the monks and offered them money, 300 gold coins. The guards refused the money and wanted to warn the inhabitants about the misfortune threatening them. But the newcomers bound them and put their own guards at the doorway. They took apart the church platform above the tomb with the relics. In this effort the youth Matthew was excessive in his zeal, wanting to find the relics of St Nicholas as quickly as possible. 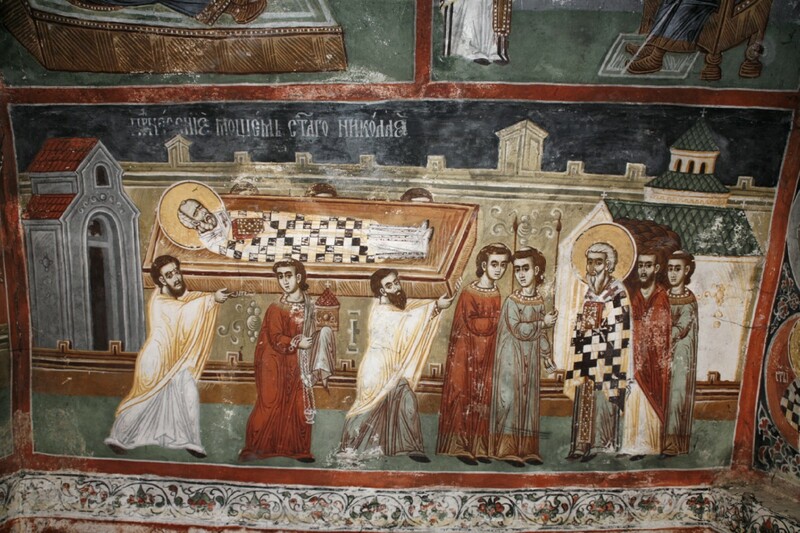 In his impatience he broke the cover and the barons saw that the sarcophagus was filled with fragrant holy myrrh. The compatriots of the barons, the priests Luppus and Drogus, offered a litany, after which the break made by Matthew began to flow with myrrh from the saint's sarcophagus. This occurred on April 20, 1087. On May 8 the ships arrived in Bari, and soon the joyous news made the rounds of all the city. On the following day, May 9, 1087, they solemnly transported the relics of St Nicholas into the church of St Stephen, not far from the sea. The solemn bearing of the relics was accompanied by numerous healings of the sick, which inspired still greater reverence for God's saint. A year afterwards, a church was built in the name of St Nicholas and consecrated by Pope Urban II. This event, connected with the transfer of the relics of St Nicholas, evoked a particular veneration for the Wonderworker Nicholas and was marked by the establishment of a special Feast day on May 9. At first the Feast day of the Transfer of the Relics of St Nicholas was observed only by the people of the city of Bari. It was not adopted in the other lands of the Christian East and West, despite the fact that the transfer of the relics was widely known. This circumstance is explained by the custom in the Middle Ages of venerating primarily the relics of local saints. Moreover, the Greek Church did not establish the celebration of this remembrance, since they regarded the loss of the relics of St Nicholas was a sad event. 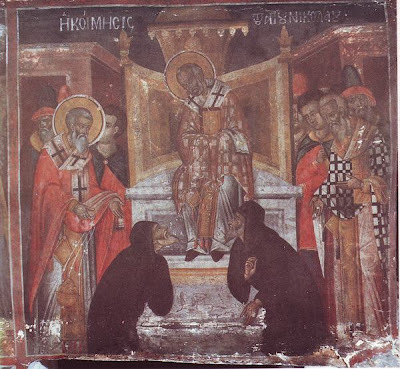 The Russian Orthodox Church celebration of the memory of the Transfer of the Relics of St Nicholas from Myra in Lycia to Bari in Italy on May 9 was established soon after the year 1087, on the basis of an already established veneration by the Russian people of the great saint of God, brought from Greece simultaneously with the acceptance of Christianity. The glorious accounts ot the miracles performed by the saint on both land and sea, were widely known to the Russian people. Their inexhaustible strength and abundance testify to the help of the great saint of God for suffering mankind. The image of St Nicholas, a mighty wonderworker and benefactor, became especially dear to the heart of the Russian people, since it inspired deep faith and hope for his intercession. The faith of the Russian people in the abundant aid of God's saint was marked by numerous miracles. A significant body of literature was compiled about him very early in Russian writings. 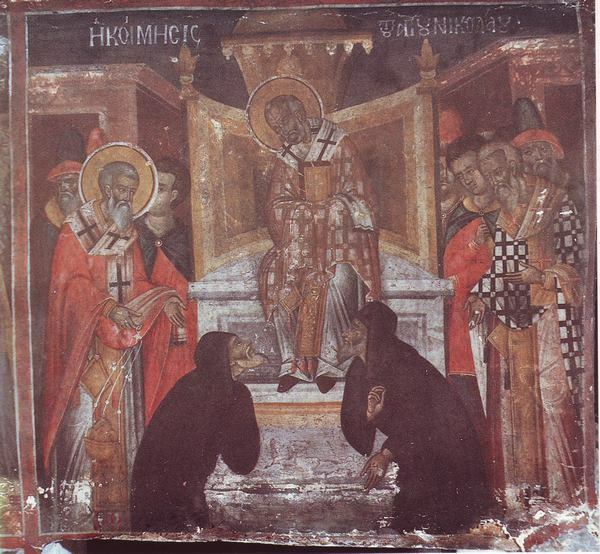 Accounts of the miracles of St Nicholas done in the Russian land were recorded at an early date. Soon after the Transfer of the Relics of St Nicholas from Myra to Bari, a Russian version of his Life and an account of the Transfer of his holy relics were written by a contemporary to this event. Earlier still, an encomium to the Wonderworker was written. Each week on Thursday, the Russian Orthodox Church honors his memory in particular. Numerous churches and monasteries were built in honor of St Nicholas, and Russian people are wont to name their children after him at Baptism. In Russia are preserved numerous wonderworking icons of the saint. Most renowned among them are the icons of Mozhaisk, Zaraisk, Volokolamsk, Ugreshsk and Ratny. There was no house or temple in the Russian land in which there was not an icon of St Nicholas the Wonderworker. 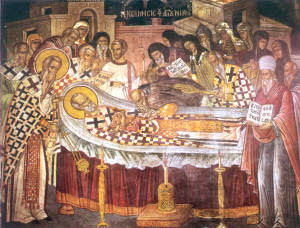 The significance of the intercession of the great saint of God is expressed by the ancient compiler of the Life, in the words of whom St Nicholas "did work many glorious miracles both on land and on sea, aiding those downtrodden in misfortune and rescuing the drowning, carried to dry land from the depths of the sea, raising up others from corruption and bringing them home, liberating from chains and imprisonment, averting felling by the sword and freeing from death, and granting healing to many; sight to the blind, walking to the lame, hearing to the deaf, and speech to the mute. He brought riches to many suffering in abject poverty and want, he provided the hungry food, and for each in their need he appeared a ready helper, an avid defender and speedy intercessor and protector, and such as appeal to him he doth help and deliver from adversity. Both the East and the West know of this great Wonderworker, and all the ends of the earth know his miracle-working." "St. Nicholas the Wonderworker, Archbishop of Myra in Lycea in the region of Asia Minor, is closely linked to our island [Zakynthos], because of the passage of the remains [Holy Relics] through the Ionian Sea, during the long journey from being transferred from Myra to Bari, Italy, in the spring of 1087. Towards the end of 11th century, Myra saw the devastation from the incursions of the heathen Turks. According to tradition, Saint Nicholas appeared in sleep to a pious priest of the town of Bari and stressed the necessity to transfer the remains. Thus, Clergy and People of the region, with three ships, left for Myra, where without much difficulty they received the Holy Relics of the Saint, which remained buried for more than seven centuries, taking them to the "safety" of the West. They reached Bari on the 20th of May, when the relic was accepted with tears of emotion. There, later, was built a magnificent temple, where they were placed. During this journey they must have passed the Ionian islands. It certainly is not historically documented which island they stopped at, but it is certain that the passage was recorded in the consciousness of pious people of Zakynthos. So, from then until now, this Passage is celebrated on the 10th of May, allegedly the day "St. Nicholas [who] Passed-by." Thus, even though there are may be various emotions, opinions and disagreements about the fate of St. Nicholas' Remains, as Christians we can thank Christ our God for giving us such a great intercessor, who "passes-by" constantly to help and heal so many throughout the world. Even in the United States we have witnessed the Grace of Christ and the Relics of St. Nicholas work many healings, show forth weeping icons, and perform many miracles for the faithful. Until St. Nicholas' dying breath, he hoped and put his trust in the Lord. May we learn to have such hope in the Lord, and in the protection and help of His Saints. Come let us all piously praise with hymns, the veneration of the divine relic of the blessed Shepherd, crying to him joyfully: Help us who faithfully praise you, we who are in all kinds of dangers, O Hierarch Nicholas. Glory to Christ Who glorified you, praising you with hymns, and Who radiantly showed you forth as our boast and an example of holiness. 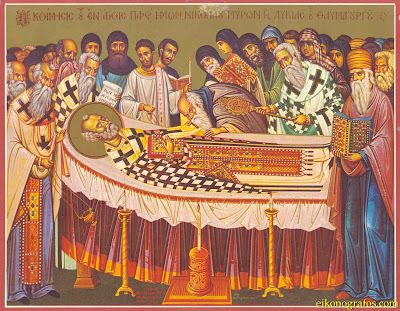 Though you descended into the grave, O Nicholas, yet you visit us who hymn you, and you, as an intercessor towards God, grant to the faithful you entreat you, speedy help, O leader and Hierarch of the people of Myra. Open my mouth, O God my Savior, and fill it with divine wisdom, that I might be strengthened to worthily hymn the Great Teacher among Hierarchs, the Shepherd and Leader of the people of Myra, he who was truly innocent, undefiled, and blameless in all things, the protector of widows, the Father of orphans, the entreater for sinners, the savior of the innocent, and the guide and protector of those who sail the seas. And through the divine passage of his relic, he sanctified the world. But being astonished by the multitude of his divine graces, I cry to him with faith: Protect and preserve the world through your intercessions, O leader and Hierarch of the people of Myra. 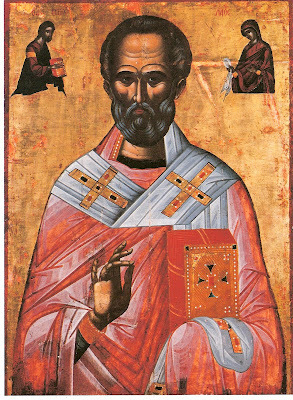 On this day [either May 9, 10, or 20] we celebrate the Passage of the Sacred and Holy Relic of our Father among the Saints, Nicholas Archbishop of Myra of Lycia, the wonderworker. With befitting words, let us all faithfully praise the holy passage of your body, O divine Nicholas, and may you protect those who call upon you from every danger, unharmed. Through the prayers of our Holy Fathers, Lord Jesus Christ our God, have mercy on us and save us!